Time for another Muffin Tin Monday! Recently when we had a hot stretch I had cravings for a lighter supper and wanted to make some salad type dishes. So I made a simple pasta salad (in a lemon juice/olive oil/pressed garlic dressing) and a salmon salad. I wasn't sure the kids would actually eat the salmon salad, since I don't think I've ever made it before. Cort adored it, and Pierce ate all of his. Reid was the only one that wouldn't touch it. The kids had theirs with breadsticks, and they got preacher cookies for dessert. Incidentally, I substituted 1 tsp of coconut oil for the 1 tsp of butter that my preacher cookie recipe calls for, and it gave them a different (but quite tasty) flavor. 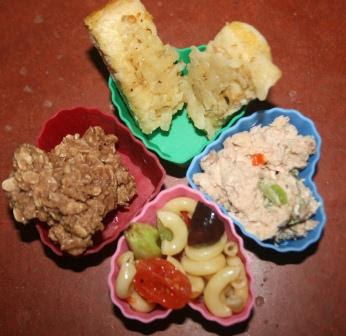 For more fun kids' lunch ideas, check out Muffin Tin Mom. I made a big pasta salad yesterday too... at Hubby's request. It's one we have been making for years and a great pleaser during the summer months. Yours looks good too!! The perfect summer meal. I have never tried salmon salad, but like salmon, so must give it a try. I love salad season! It seems to be the only way that I can get my 2 year old to eat his veggies. I think these look delicious! I love the cookies! You always have the best ideas! How cute are these! That looks like a great light lunch. We need to do those too, it is getting HOT here! Yummmmmmm. That's all I can say. It all looks so good. I love pasta salads because you can change them up so easily. Salads in hot weather are the best! I've never heard of preacher cookies-but they look good too! These hot, humid days are definitely the kind of days calling for a lite evening meal! I love this! Everything looks so tasty. Hope you enjoy the afternoon. You've captured the notion that food should be fun!!! How did you make the salmon salad??? Pasta salads=summer! Yours look good. Summer salads are the BEST... and easy too. The cookie looks good.. It all looks good, but the cookie caught my eye. Probably because it is something I can't have. We just read this, and now we are hungry- but its time for bed! I've been substituting a little coconut oil in my recipes for the shortening and I love the results! Getting 2 out of 3 to eat salmon salad is pretty good! Pasta salad looks delicious. Looks yummy. Do you have the recipe for the salmon salad? I love pasta salad and cooler, lighter dinners in the summer. And, what are preacher cookies? I've never heard of them, but they look good!